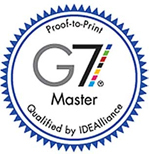 The Castle Press is G-7 Certified. Out of 1,700 printing companies that are located in Southern California, 59 are certified. Castle Press is proud to be part of this very small elite group of techno-forward companies. Why G7 Professional Certification? Brand owners, creatives, agencies, publishers, premedia service providers and printers are always in the market for professionals who bring leading-edge skills, knowledge and experience. Today, one of the critical differentiating job skills is rapidly becoming the expertise in the G7 Proof to Press Process. Likewise, organizations from across the digital media supply chain are seeking the assurance that their partners and suppliers employ professionals who can reliably achieve the “similar visual appearance” (i.e. branding) that G7 promises when used as a process control tool from creation through delivery in any media – from catalogs to packaging, from high-end marketing materials to signage to publication advertising. IDEAlliance, the source of all that is G7, is in the unique position to offer this valuable new certification program to meet this emerging industry requirement. Individuals can achieve recognition for their G7 expertise or organizations can distinguish themselves by certifying their staff to G7 process controls.